Microsoft Dynamic GP provides financial management functionality that includes general ledger, accounts payable, and accounts receivable modules to bank reporting, cash flow management, and reconciliation. It’s like ERP software. Dynamic GP 10.0 has same look and feel like Microsoft Office Outlook and it also extend its business functionality through Microsoft Office SharePoint Server 2007, SQL Reporting Services, Web Services, BizTalk, Microsoft Office Excel, and Microsoft Office Word. After integrating Dynamics GP 10.0 with MOSS 2007, users can access and analyze data from Dynamics GP and from any other application. User can easily create and deploy Office Excel reports to SharePoint Server. 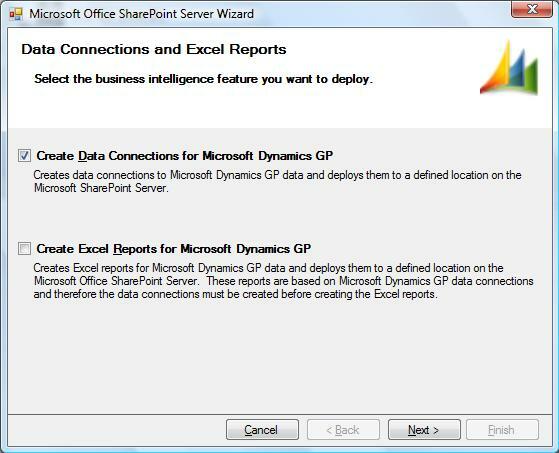 Dynamic GP can export all their excel reports to SharePoint site in data connection and report library, when we are installing Dynamic GP 10.0, one installer/connector or utility is come with Dynamic GP which will helpful for connecting Dynamic GP SQL Server database and exports all company or specific company records to SharePoint site and create data connections and report library into given SharePoint site. 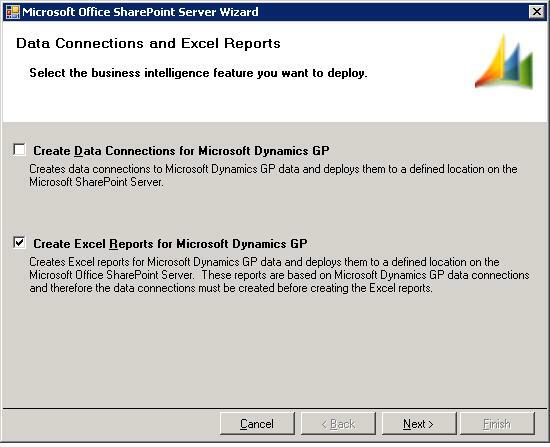 Steps for integrating and configuring Dynamic GP 10.0 to SharePoint site for excel reports which will be displayed into excel services. 1. 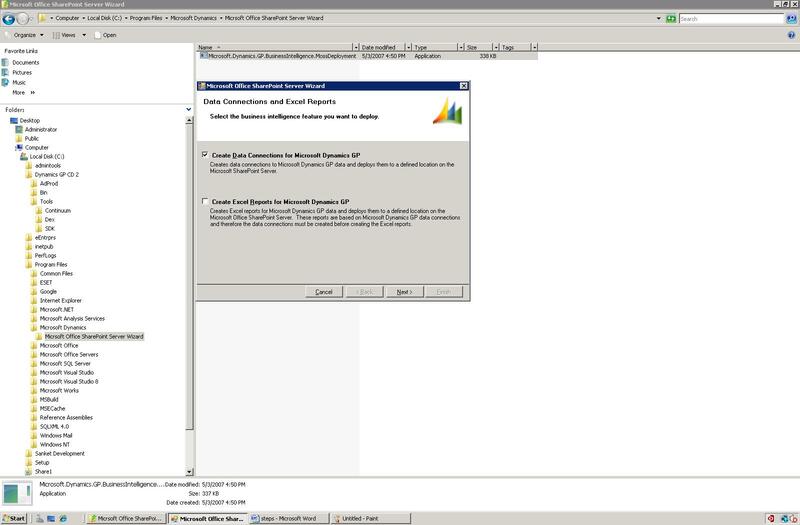 Click on connector installer for Microsoft.Dynamics.GP.BusinessIntelligence.MossDeployment and first select Data Connection checkbox for Microsoft Dynamics GP, it will deploy to SharePoint server. 2. 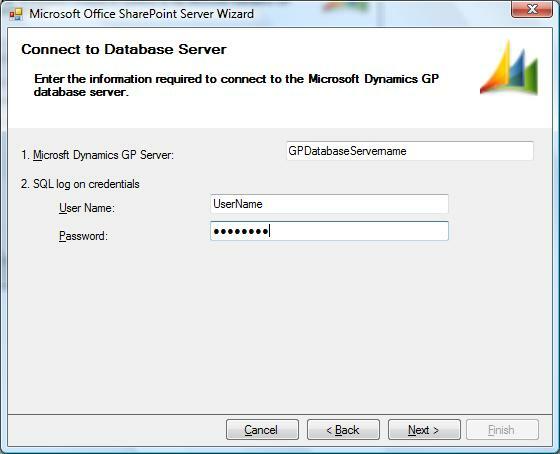 Enter Dynamic GP Database server name and credentials for accessing database server. 3. 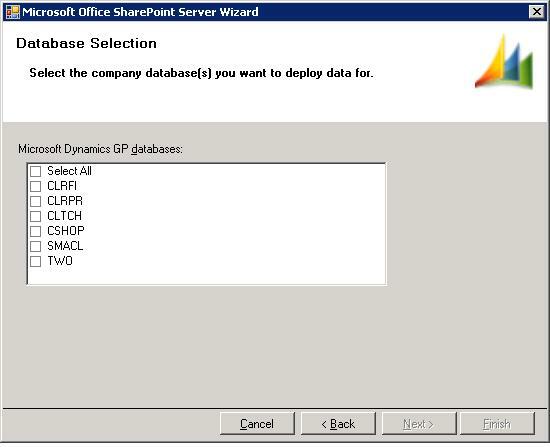 Select the respective Dynamic GP Databases, which we want to deploy to SharePoint server. 4. 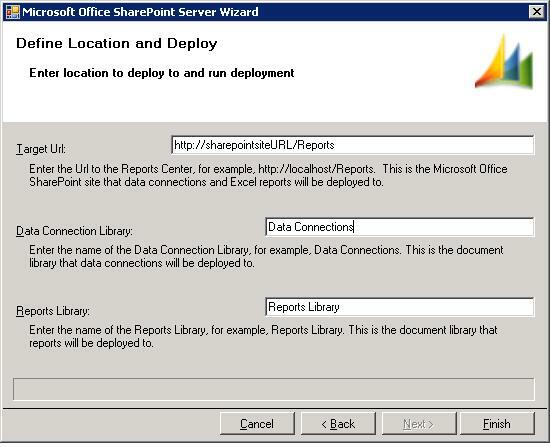 Give the SharePoint site URL and Data connection and Report Library name in which are data connection and report will be deploy. 5. Now follow same step from step No 1 for creating excel reports for the Microsoft Dynamic GP data, first we have created Data connection, because before creating excel reports, it require connections. Follow same step from 2 to 4. After doing above process, it will create data connection and reports into SharePoint site into Data Connections and Report Library as per below screenshot. Now we can open Report Library and open excel reports into excel services of the SharePoint site. 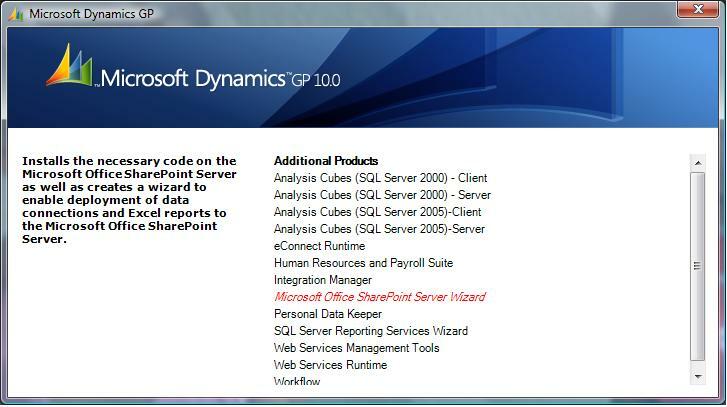 I am trying to integrate GP with Sharepoint 2007, where can I find the Office Sharepoint Server Wizard?